“Viyathmaga”(Erudite Path) is an organization that claims to be dedicated to the goal of “an Intellectually inspired Sri Lanka”. It is said to possess an elitist membership comprising top level professionals, academics and entrepreneurs of Sri Lanka. The Viyathmaga website describes the organization in the following manner -“The Professionals for a Better Future (VIYATHMAGA) is a network of Academics, Professionals, and Entrepreneurs who love the country and wish to contribute actively towards the development of a prosperous Sri Lanka where all citizens can live in peace and harmony. VIYATHMAGA is not a political organisation. It is a civil society movement, wishing to contribute towards the betterment of the country”. Viyathmaga articulates its vision as seeking to ” mobilize the nascent potential of the professionals, academics and entrepreneurs to effectively influence the moral and material development of Sri Lanka in par with the other developed countries where all citizens live in an environment of equity and fair play, with equal opportunities in the advancement of these ideals”. * To provide a common forum for Sri Lankan scholars, professionals and academics with patriotism and a sense of purpose, living here and abroad, to network for the noble cause of influencing those policy makers and legislators to steer the country in the correct path with accountability. * Conduct District wise campaigns and workshops to create broad awareness of the objectives among the likeminded, in order to build up a non-violent, discerning public opinion on matters affecting the livelihood and betterment of all citizens in Sri Lanka. * Mobilize the expertise and knowledge of the members of this forum in innovating and developing strategies and policies which would influence the decision making of the government in power, for the greater good of the society. *To act as a pressure group to the prospective decision makers in Government and Public bodies to motivate good governance and inculcate democratic values. *Identify and project honest, capable and committed individuals in all three tiers of governance. * Be an effective and recognized organization capable of interacting with Sri Lankan diaspora domiciled abroad and foreign missions here and abroad for intellectual dialogue on matters concerning Sri Lanka. Notwithstanding its avowed lofty ideals – Viyathmaga – in recent times has been viewed in most sections of the media as an elitist organization with a predominantly “Sinhala”membership that is determined to enthrone former Defence and Urban Decelopment Secretary Nandasena Gotabhaya Rajapaksa known popularly as Gota Rajapaksa or “Gota” in a powerful politico-administrative position in Sri Lanka. Gotabhaya Rajapaksa is the chairman of Viyathmaga. Whether this perception is correct or not the current reality today is that a vast number of people share this perception and as is the case in many instances such perceptions are indeed becoming the reality. Viyathmaga held its annual General meeting for 2018 in the form of a convention-seminar in the ballroom of plush Shangri-la Hotel at Galle Face. The keynote speech was by Gotabhaya Rajapaksa. Among the invitees were former President and elder brother Mahinda Rajapaksa, former Speaker and eldest brother Chamal Rajapaksa, former Economic Development Minister and younger brother Basil Rajapaksa. Gota’s nephew and Hambantota MP Namal Rajapaksa was also an invitee but was absent due to an overseas trip. Former Malaysian Prime Minister Dr.Mahathir Mohammed made headlines recently by getting re-elected as Premier again at the age of 92. Mahathir Mohammed is regarded as the foster father of the Malaysian ” Bhumiputra” movement that encouraged economic advancement through preferential treatment for those of Malay ethnicity over those of Chinese,Indian and European descent in Malaysia. One of the highlights of Mahathir Mohammed’s 22 year rule was his unveiling in 1990 of an economic blueprint phased out over 30 years for the betterment of his country.It was themed as Mahathir Mohammed’s “Vision for 2020″.Likewise in a significant gesture that evoked a sense of Deja Vu vis a vis Mahathir Mohammed, ex-Defence Secretary Gotabhaya Rajapaksa during his Viyathmaga keynote speech also unveiled his own ” Vision 2030″ for Sri Lanka.It appeared that Gotabhaya Rajapaksa sought to re-invent himself as a man with an eco nomic vision on a political mission. “He stressed that infrastructure development was critical for the country but returns would be yielded only in the long run. He said that the state should not invest without analysing market realities in order to obtain optimal returns and that state enterprise must make state funds profitable and ensure employees were given fair wages. “Investments should be equitable and profitable,” he added. “Focusing on corruption, he said that state sector corruption was a hindrance for economic growth hence systems and processes must be introduced to ensure officials could not indulge in corruption and politicians of stature and high-calibre state officials should be identified to take lead roles. In summing things up, Gotabaya said it was time to embrace nationalism. “Love your country, play your part in its future,” he said, reminding people that everyone counts and Sri Lankans had to move beyond divisions of race and religion. “We are one. Sri Lanka’s future is in our hands,” he stated. “But to those trying to look for clues, Gota’s concentration on the economy could be seen as a move to prove that he was not a one dimensional military man but someone who could shift from fighting a war, to urban development and to economic policy with ease. He said that by 2030, the prognosis was that the Chinese economy was projected to become twice the size of the American economy. India was to come third, Japan fourth and Indonesia will become the fifth. He posed the question whether Sri Lanka was ready for this transformation of the global economy and said that Viyath Maga was engaged in studying how Sri Lanka should be positioned by 2030. Economic growth was posited as the top priority for Sri Lanka. He said that other Asian countries had demonstrated that it is possible to achieve our economic goals and open the country to the world while yet safeguarding our culture and our sovereignty”. The author of “Gota’s War” who is presumed by some as possessing an insight into the mindset of Gotabhaya Rajapaksa concludes his piece by opining “If anyone was looking for clues that this was Gota’s pitch for the presidency, the whole event seemed replete with evidence that it may indeed be that”. Apart from Chandraprema some websites also interpreted or depicted Gota’s speech at the Viyathmaga convention as an indication of his intention to contest the next presidential elections in 2020 as the joint opposition candidate. Gota himself in various interviews has stated that he is not averse to the idea but had not made up his mind yet. In any case “Gota Malli”has repeatedly pointed out that the final decision would have to be made by “Mahinda Aiya” -his elder brother Mahinda Rajapaksa. Though there is speculation in some circles that there are differences between the Rajapaksa’s over the presidential stakes, Gota’s responses in interviews has made two things clear. Firstly he would contest only with the approval and support of Mahinda Rajapaksa. Secondly all the Rajapaksa brothers would stand unitedly behind the candidate selected by Mahinda. Even though Gotabhaya is being talked of as a presidential candidate filling in for Mahinda Rajapaksa, the same 19th Constitutional amendment which blocked Mahinda Rajapaksa from contesting the presidency again has also prevented Gotabhaya also from contesting presidential elections since he is a dual citizen of both Sri Lanka and the USA. Prior to the 19th Constitutional Amendment being enacted, it was possible for people with dual citizenship to contest elections in Sri Lanka. When the Sirisena-Wickremesinghe Govt. replaced the Rajapaksa regime in January 2015 , many of the bottlenecks surrounding the obtaining of dual citizenship by Sri Lankan expatriates were removed. Despite these “dual citizenship friendly” actions, the new regime introduced a problematic provision in the 19th Constitutional Amendment debarring dual citizens from contesting Parliamentary and Presidential elections in Sri Lanka. It was widely believed then that the provision was a pre-emptive move to prevent ex-President Rajapaksa’s sibling Gotabhaya Rajapaksa from seeking electoral office. Former Defence and Urban development secretary Gotabaya Rajapaksa is a controversial personality who is loved by some and hated by others. 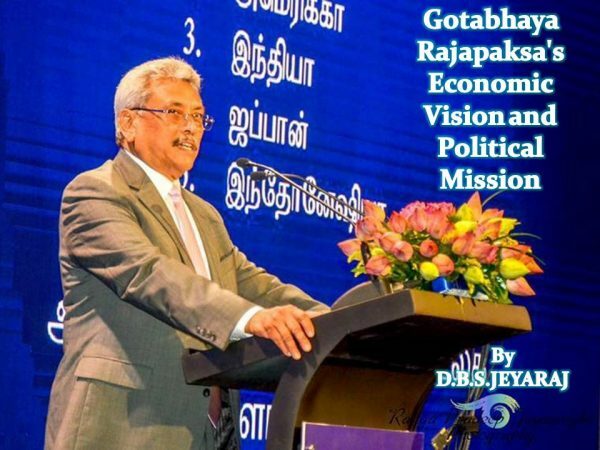 There is a school of thought in Sri Lanka which is optimistic that Gotabaya Rajapaksa is destined to rule the country in the future just as his elder brother did. The Nineteenth Constitutional amendment has reversed the Eighteenth amendment and blocked Mahinda Rajapaksa from contesting for the presidency again. If the envisaged new constitution materialises and the executive presidency is abolished and the Prime ministerial office is further empowered then Mahinda Rajapaksa can or may seek Prime ministerial office.If however, the diluted executive presidency continues to remain then an alternative to Mahinda has to be found. Many think the alternative is Gotabhaya. In recent times the Gotabhaya fan club has been working overtime promoting the retired Army Colonel as the prospective presidential candidate. This support for Gota suffered a minor setback last year when former actress Geetha Kumarasinghe was unseated as Galle District MP by the courts because she was a dual citizen of Sri Lanka and Switzerland. As of now Gotabhaya Rajapaksa is a dual citizen holding US citizenship. His only son is well-settled in the US. If Gota is to contest the presidential or Parliamentary poll in the future he would have to give up his US citizenship. In spite of critically denouncing the US at times, Gotabhaya has not shown any inclination to renounce his US citizenship so far. Some months ago when Gota addressed the Foreign Correspondents Association in Colombo the ex-Defence secretary was non – committal about renouncing US citizenship and entering active politics. Mahinda too has not been too enthusiastic about Gota contesting polls to date. aya would never opt to lose his dual citizenship status. It remains to be seen whether this calculation is correct or not. Despite these doubts about the eligibility or willngness of Gotabhaya to contest the presidential poll, recent events indicate that Gotabhaya like Barkis the Dickensian character in “David Copperfield” is now willing. 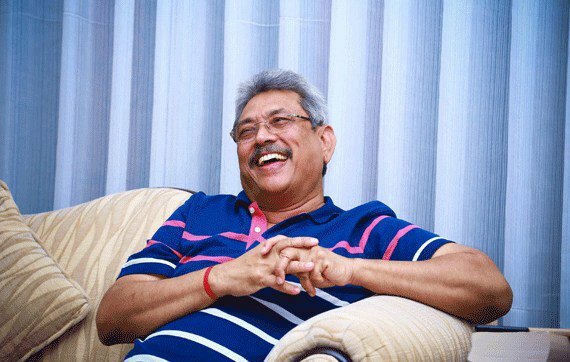 While saying he is yet to make up his mind, the ground reality seems to be that of Gota being “ready,able and willing” if Mahinda Rajapaksa gives the go ahead signal. Gota would renounce US citizenshop at the appropriate juncture if given the green light to be candidate. According to knowledgeable circles all that Gotabhaya Rajapaksa has to do is to make an unequivocal, unambiguous declaration that he is renouncing US Citizenship at the US embassy in Colombo. Thereafter his US citizenship will be revoked and will lose dual citizenship. The process is expected to be over in a matter of few weeks. In the case of Geetha Kumarasinghe the blunder she reportedly made was in assuming incorrectly that communicating with Swiss authorities by letter would be sufficient. Apparently it was not! Gotabhaya appearing to be somewhat hesitant to enter the presidential election fray is perceived by some detractors to be a political drama.They think he is feigning reluctance and that he is very eager for power. Others however say that the wavering is not political pretence and that Gota was indeed placed in an agonizing dilemma like Shakespeare’s Hamlet. He did not like electoral politics and he did yearn to spend his twilight years in retirement in the USA with his only son.However they say that the indecisiveness is now over and that Gota has now resolved to throw his hat into the ring. A number of inquiries are being conducte and cases have been filed in courts against Gotabhaya and other members of the Rajapaksa family over many alleged offences. Gota himself has obtained court orders staying his possible arrest over some of these matters. He has consistently proclaimed his innocence in these cases and accused the present government of conducting a political vendetta against him.The constant attempts by the Sirisena-Wickremesinghe regime to pursue – what is perceived by Gota to be – a witch -hunt against him and the Rajapaksas has compelled him to lock horns in political combat. Gota has resolved to answer the Hamlet -like dilemma in his own way. Gota does not want to suffer the slings and arrows of outrageous fortune and instead wants to end them by opposing. Besides he also believes that the country is at peril and needs him. For all these reasons Gotabhaya Rajapaksa seems to have indicated his willingness and readiness to contest the next Presidential elections. 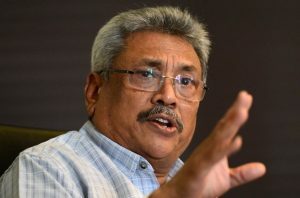 Gota is projected as a leader for change on a political mission with an economic vision. Although he is trying to project an image of being an economics oriented man with a mission above race and religion , it is doubtful whether the extremist ethno-religious elements who have been supportive of him in the past would ever let him follow that course. It remains to be seen whether Gota could break free of these bonds even if he wants to do so. An immediate question that arises is whether a Gotabhaya candidacy could attract votes from the ethnic and religious minority communities of this country by embracing diversity or whether it would pander only to mono-ethnic majoritarianism. There is also the larger question as to whether economic upliftment and renaissance alone could bring about understanding, amity and reconciliation among the diverse sections that make up the plural society of Sri Lanka. These and other related matters would be delved into deeply in a forthcoming article. « USA and Western Nations Wont Allow Former Defence Secretary Gotabhaya Rajapaksa Become President of Sri Lanka;Outgoing US Ambassador Atul Keshap Bluntly Tells Ex-President Mahinda Rajapaksa.